One item out of last Thursday night’s Board of Selectmen meeting should make preservationists happy. The Town received a bid to purchase Fayville Hall. The bidder plans to preserve the historic building’s facade. The bid is contingent on relocating two Affordable Units from a previously approved development that has long been on hold. 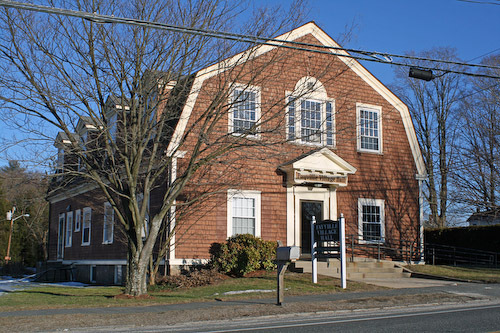 At last week’s Board of Selectmen meeting, Town Administrator Mark Purple shared that only one bid was received for the Town’s RFF for Fayville Hall. The bid was from Bartolini Builders. The bid comes with several contingencies that have to be met. Not many details were shared during the BOS discussion. Fortunately, they were included in the meeting packet. That includes the developer’s low asking price of $5,000. The low offer wasn’t remarked on by selectmen. In the past, the board has been eager to rid themselves of expenses and liabilities related to maintaining the site. The board failed to get Town Meeting voter approval to dispose of the property in 2016. In 2017, voters approved the request, but only after the board promised to make preservation a consideration. That was one of the stated factors for judging bids in the RFP the board approved in January. On Thursday, Selectman Brian Shifrin quipped that they received more bids than he expected. For those of you unfamiliar with the building’s history – the almost 100 year old building was the community center for the village, hosted WWI war relief efforts, and served as a health center with tent hospital to handle the 1918 influenza epidemic. You can read more about that here. Before signing off on the bid, selectmen will ask the Planning Board and SHOPC (Southborough Housing Opportunity Partnership Committee) to give their feedback on the viability of some contingencies. Two of specific interest are plans to use the building for three Affordable Housing units and the request that two of those be relocated from a previously approved subdivision. The units would be relocated from Ila Bella Estates (initially known as Rossi Estates). The subdivision planned for the intersection of Breakneck Hill and Mt. Vickery Roads was approved to consist of 10 single family homes and a duplex for the 2 affordable units. It’s a project that has been around without much apparent progress since 2006. In 2009, Susan posted about multiple project extensions and an expected delay. The project was again approved in 2015 and Planning announced that construction was beginning. But the devloper came back to Planning this past October to request an extension for the construction deadline. The Planning Board granted an extension to October 2019. For more details on the developer’s plans and contingencies, see the bid paperwork from the BOS packet last week, here. Updated (6/13/18 9:05 am): Southborough Wicked Local also covered this story. Initially, I thought it was a brief blurb without much detail. But, it turns out that if you scroll down past the break in the story, there’s a lot of good detail there. You can read more about the value of the property, the history, and the developer’s bid here. Was there a minimum bid price? How was this property marketed? How long was the property marketed? Who in God’s name is managing this process? Did someone leave a few zero’s off the reported pricing above? Is someone kidding??? BOS: These answers should be provided for the public’s knowledge and taxpayer’s edification at the next BOS public meeting. Not interested in some justification. Has anyone ever heard of the term “comparable sales?” and “other sales activity?” Holy cow, basic due diligence please! In my humble opinion, this situation should be re-evaluated immediately. The property should be properly re-marketed by an experienced professional with a contingency on minimum floor pricing. No minimum price met, no sale. I was pleased to serve as chair of the Fayville Hall Disposition Committee, and our group worked hard to consider the points set out in the RFP. Mr. Bartolini’s expression of appreciation for the history of Fayville Hall is certainly welcomed and encouraging news! Anyone interested in learning more about the history of the hall can arrange a visit to the Southborough Historical Museum. Not interested in any emotional pitch. This is all about the Town’s taxpayers getting the best possible pricing for this asset, checks and balances via multiple checks on pricing, and using professional services on due diligence and disposition management. I respectfully suggest that what “this is all about” might vary from one individual to another. I assume you’re being facetious about your bid. But as to the requirement that they take the highest bid, you seem sincere. I believe that you are incorrect. The RFP process was to consider several criteria. Proposals were to be weighed based on five equal factors. Before comparing financial bids, they were to look at: Historic preservation, Parking accommodation (for the public recreation across the way), Affordable Housing, Septic, and Permitting. You can see more about that here. Remember, voters rejected the the selectmen’s request to sell the building in 2016 after preservationists asked for time to pursue options. Enough commenters at the 2017 Town Meeting seemed in favor of trying to preserve the historic facade that selectmen were compelled to promise to make that a factor in an RFP process before securing permission to sell. Obviously, it would be better to get a bid that was higher, offered more additional affordable housing, and made a clearer promise about parking access. But comparing the low bid to a just slightly higher bid that offers none of those things is absurd. It seems to me – selectmen will have to weigh how much preserving the facade (and adding one additional affordable unit to the Town’s inventory) is worth. And it seems they are waiting for input from Planning and SHOPC before having that discussion. Although, since real estate value is part of that, I don’t know if that will be a public or closed discussion.